We feel a sense of pride in having a community of passionate customers who are serious about solving the scaling agile challenges in their organizations. We are very contemplate of the feedback we receive about the pain points that these organizations have to endure. At Kendis, we are continuously improving and striving for greatness. In this latest release, we have rolled out a new set of features that will help the organizations in their day to day activities for planning and tracking programs. The PI burndown chart is an invaluable asset to planning and tracking. It depicts a visual glance that allows better Scope Management for the Program Increment. It gives you an idea of the overall scope of each sprint and anything that is not part of the task list is excluded from the Scope of the sprint. It also helps in Schedule Management as the burndown chart is updated daily with the effort details. This ensures that the teams are updated and on track with the progress. Having the ability to view dependencies that are required to be resolved in a previous sprint or the ones needing to be addressed in the upcoming sprint is a great capability. This is hugely beneficial for for Release Train Engineer (RTE), Scrum Masters, Program Managers, and others as it saves them a lot of time. These dependencies can also be easily exported as an Excel or a PDF format file. Program Increment (PI) objectives are a set of directives that are summarized to describe the technical and business elements of a goal that need to be achieved by an Agile team or an Agile release train. These objectives serve the basis of PI planning and alignment of the outcomes. In Kendis, you can create objectives for your teams and for the PI. You can also create custom objectives and rename them to PI or other objectives. Use the “Drag and Drop” action to reorder cards to any position in your backlog. Although this feature has been available in Kendis since day 1, we have now made the experience smoother and faster. In this release, we have introduced a single-click reordering of the cards in the backlog. The GIF below demonstrates how this can be done. In Kendis and at JIRA, there are 3 categories of the status “To Do”, “In Progress” and “Done”. Now it’s possible to filter the feature cards in the “Feature List” backlog with statuses. Filter options are shown by “category”. 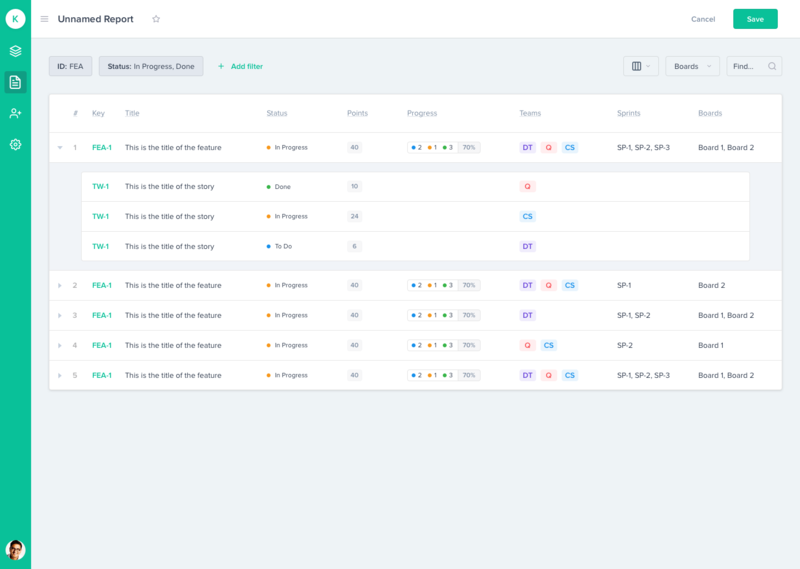 Kendis-Only cards provide a flexible way to plan and capture the Risks, Vendor Deliveries, Milestones or any other activity that is not managed in JIRA projects. We have also released a short ID or key field to the “Kendis Card” with the ability to link to any URL. This offers the option to link the card to any document, wiki page or confluence pages. The picture below describes how it can be done. Our teams are tirelessly working to bring the best experience to you in Kendis. Here are the highlights of some features that will be part of the upcoming release of kendis. Compile and collect the data from multiple different boards (Release Trains) into one report and share it with your stakeholders. This report can also be used to track the progress of specific features or teams. Integration with Microsoft Azure Boards and TFS (Microsoft Visual Studio). Ability to view the flagged items at Kendis – features and stories flagged at JIRA will show up at Kendis and vice versa. Ability to sync dependencies created at Kendis to JIRA and vice versa. Here is the sneak peek of our upcoming reporting view.